The North Texas Sailing School is located at the Rush Creek Yacht Club on the east shore of Lake Ray Hubbard, renowned in the Dallas area for ideal sailing conditions. Lake Ray Hubbard is about 20 miles northeast of downtown Dallas and is conveniently accessed via Interstate 30. It covers approximately 23,000 acres and 111 miles of shoreline at an average depth of 30 feet. We offer sailing lessons to the general public, starting with Beginning, and Intermediate sailing instruction, along with upper level classes including Spinnaker, Basic Coastal Cruising and Coastal Navigation. 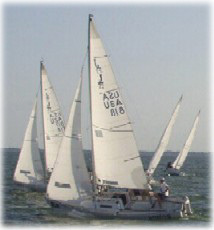 Alumni sailors enjoy year round sailing activities and have the opportunity to sail on a weekly basis. As Dallas' oldest sailing school, our students turn to sailing as a recreational outlet, and hundreds go on to race competitively all over the world. All North Texas Sailing School instructors are certified to American Sailing Association standards and several hold advanced certifications.